Search engine optimization (SEO) is the process of improving the visibility of a website or a web page in a search engine’s “natural” or un-paid (“organic” or “algorithmic”), search results. In general, the earlier (or higher ranked on the search results page), and more frequently a site appears in the search results list, the more visitors it will receive from the search engine’s users. SEO may target different kinds of search, including image search, local search, video search, academic search, news search and industry-specific vertical search engines. A variety of methods can increase the prominence of a webpage within the search results. Cross linking between pages of the same website to provide more links to most important pages may improve its visibility. Writing content that includes frequently searched keyword phrase, so as to be relevant to a wide variety of search queries will tend to increase traffic. Updating content so as to keep search engines crawling back frequently can give additional weight to a site. Adding relevant keywords to a web page’s meta data, including the title tag and meta description, will tend to improve the relevancy of a site’s search listings, thus increasing traffic. URL normalization of web pages accessible via multiple URL’s, using the canonical link element or via 301 redirects can help make sure links to different versions of the URL all count towards the page’s link popularity score. 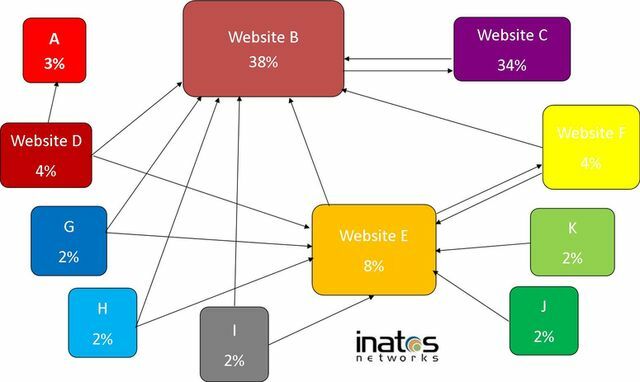 Inatos Networks Ltd can evaluate your website starting from a fundamental review of the design and content of the site through to the Links to other sites. This is important as it tells the search engines what keywords and phrases are the most relevant to your website. For example if your website was designed to attract people looking for a Care home in Eastbourne we would ensure that your site was using certain keywords covering Residential Care Homes in Eastbourne. You would need to have page titles, content and meta tags that reflect these keywords. This is now considered the most important part of an SEO campaign. Your ranking across all the major search engines is based on the number of one directional inbound links to your website from other websites. This tells the search engines how popular your site is. The more popular your site is the higher search engines regard it’s relevance and therefore you will appear higher when searched for. Using the squares, labelled A to K in the diagram above to represent web pages and sites, we can see how a URL’s PageRank is calculated. The algorithm tells us that a web surfer that chooses a random link on every page/site, and does so, but with a 15% likelihood of jumping to a random page on the whole web, but will actually end up staying on Site E for 8.1% of the time due to the directional linking relationships. The 15% likelihood of jumping to an arbitrary page, according to the algorithm, corresponds to a damping factor of 85%. It is determined that without this damping factor, all web surfers would eventually end up mostly visiting Sites A, B, or C, leaving all other pages with a PageRank of zero. It is interesting to note that even though Page A has no outgoing links, it is logical to assume, that A is still invariably linked to all pages in the web simply by this one inbound link. In order to find how we can help you contact us.